Do Rice Cookers Work On Brown Rice? It's time we know once and for all. There was a little rumor going around that brown rice couldn't be prepared properly in a rice cooker. Rice cookers are beloved for their simple settings, their multifunctions (you can bake a cake in there) and easy one-pot clean up. But killjoys say the countertop machine isn't adept at cooking brown rice. They complain the rice is too hard, half-cooked or, in the worst case, still raw in a pot of lukewarm water. Even though brown rice and white rice are the same grain, they do cook differently. 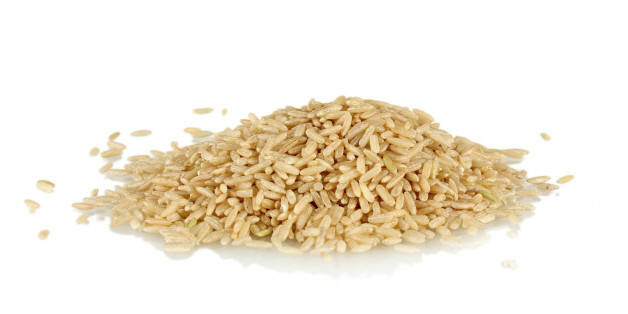 White rice is stripped of its bran layer and the germ, while brown rice has both in tact. This is why brown rice tends to be crunchier, and ostensibly, takes longer to cook. Rice cookers aren't machines for the elite -- you can find them for under $20. They tend to have two settings -- "cook" and "warm" -- and, in that sense, are not terribly high-tech. But there are fancier cookers on the market that boast abilities beyond the conventional kind. One from Zojirushi has a "brown rice" option, among many others. To see if the brown rice setting made any difference (and if brown rice could cook successfully in a rice cooker at all) we matched up two appliances: the Cuisinart Electric Rice Cooker (4-cups) and the Zojirushi Rice Cooker (5.5 cups). We cooked a cup of short-grain brown rice in each machine by following the instructions in the individual manuals. There were a couple of key differences. It took 30 minutes for the rice to cook in the less expensive Cuisinart machine. This cooker has the two "warm" or "cook" settings and is uncomplicated. It made a subtle "click" sound when the rice was ready, as the switch light turned to "warm." The rice was average -- we had no complaints. Since this machine worked faster, we tested this rice first and thought it tasted just like normal, brown rice. It had a little al dente feel that we didn't mind, and was slightly browned on the bottom of the pan (but didn't stick). It took 80 minutes for the Zojirushi machine to cook the rice. At first, after playing "Twinkle, Twinkle Little Star," the machine displayed 110 minutes -- which is way, way too many minutes to wait for rice. Then, at 35 minutes remaining, the timer went down to 5 minutes. The sudden decrease was confusing -- not a helpful feature for anyone attempting to time their dinner prep. The machine played another, less identifiable song to signify that the rice was cooked. The rice under the lid was incredibly soft -- almost buttery -- but not mushy. It was creamy to the point of a sticky rice comparison. This was the better rice of the two, undoubtedly. To secure an absolute verdict is tough, but the bottom line is that you do not need a specialty rice cooker for brown rice. Cuisinart wins the rice game in process and in price, but Zojirushi produces the perfect brown rice (albeit, with a couple of bumps and songs along the road). Still, we don't know if the more expensive version is worth it -- we're not so particular about our rice. If you're wont to make brown rice a couple of times a week, you could justify shelling out a little extra dough.